Oh, you read that headline right. The T-fal ActiFry is a healthy fryer—which you already know is a bit too good to be true but, like a late night infomercial, can't resist hearing out. Yes, with just 1 tbsp of oil, you too can "fry" 2.2lbs of fries. And that claim seems legit, as the ActiFry uses a what looks like convection cooking (hot air blowing around) and a big stirring paddle to make potatoes crispy on all sides. 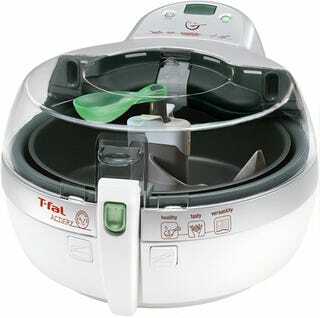 Think of it as a hot version of an ice cream maker.